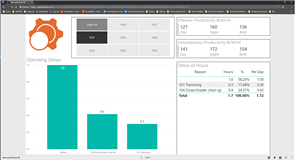 The example below is a "live" demonstration and pulls data for "yesterday's" production figures via the Eclipse Microsoft SQL Server database, the Microsoft "on-premises" data gateway and Microsoft PowerBI. You can interact with the live demo data which is similar to the type and volume of data recorded in a mine of one of our clients. Thousands of records are collected every day and are reported on the next morning, the aim of which is to improve productivity, identify bottlenecks and minimize downtime. Your business doesn't have to be involved in moving dirt to benefit from our Microsoft PowerBI services. Use our data engineering skills to help turn your information into knowledge. As soon as the new shift starts, the daily report is ready to run. This example is for the diggers/primary excavators. 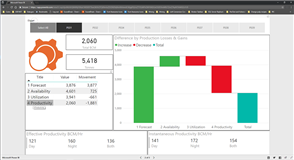 One of the useful tools in PowerBI is the slicer. Use the slicer to link queries and drill-down into your data. Microsoft PowerBI includes waterfalls charts. 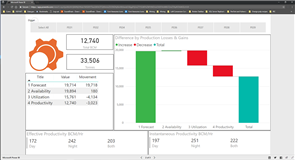 Eclipse outputs all of the data you need to compare production with targets (plans, forecasts and budgets). Digger production is calculated differently to trucks or drill-rigs. 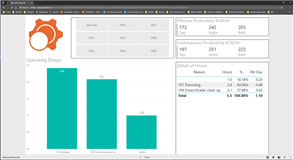 Eclipse quickly and efficiently re-queries the huge amount of data available. Try it. The morning meeting will also discuss any reasons as to why the diggers had their engines running but weren't being productive. Drill down into the individual plant to provide discussions points in the daily meetings. 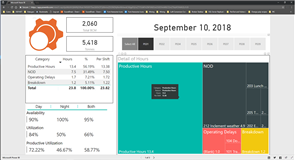 Whilst almost anybody can create PowerBI reports and dashboards quickly and easily, they tend to be of little or no value as they struggle to successfully delivery live, responsive reporting for larger datasets of often disparate data. 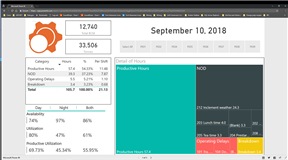 TheDevTeam have been making data work for all types of businesses for over 20 years using all sorts of tech including, but not limited to; SharePoint, PowerPivot, SRSS, Microsoft SQL Server, jSON, Big Data, Microsoft Azure stacks, Tableau, Data Warehouses, AWS, PowerQuery, Excel, OLAP, OLTP, XML, OLAP Cubes and Kimball Methodology. Call us on +44(0)1424 442400 or Contact Us to find out more on how we can help you with your Microsoft PowerBI requirements. Eclipse EMail is available to all organisations, regardless of whether or they already exist as clients of TheDevTeam. Integrate your email services with all your other business data. Well structured, targeted campaigns can be finely tuned and developed as you learn to interpret the wealth of information that's generated as a result. We are currently working on a marketing and data visualisation project on behalf of one of the World's most recognised brands and largest food and drinks manufacturers. Our bit is the most important bit but the least glamourous; creating tools to help sift, sort and consolidate masses of data so that it can be usefully interrogated. With the amount of data available to you growing exponentially, we're here to help you make sense of it all. There are now many business intelligence tools available from companies such as Microsoft, Google and Tableau but you'll need experts in data analysis if you want to make sense of it. That's where we fit in.